For other uses of "Kizlyar", see Kizlyar (disambiguation). 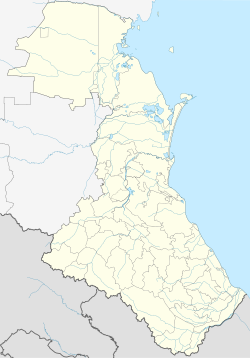 Kizlyar (Russian: Кизля́р) is a town in the Republic of Dagestan, Russia, located on the border with the Chechen Republic in the delta of the Terek River 221 kilometers (137 mi) northwest of Makhachkala, the capital of the republic. As of the 2010 Census, its population was 48,984. The first documented reference to Kizlyar dates back to 1609, although some historians associate the place with Samandar, the 8th-century capital of Khazaria. In 1735 the Russian government built a fortress in Kizlyar and laid foundations for the Caucasus fortified borderline. In the 18th and 19th centuries, Kizlyar operated as one of the trading posts between Russia and the Middle East and Central Asia. During this period, the population was largely Armenian and Russian. In 1796 2,800 Armenians and 1,000 Russians lived in Kizlyar. In January 1996 Chechen separatists raided the local airbase in the course of the Kizlyar raid, which claimed the lives of seventy-eight Russian soldiers. On 18 February 2018 five people were killed and five wounded after a shooting attack took place outside a Christian church in Kizlyar. Police killed the attacker in a shootout. Within the framework of administrative divisions, Kizlyar serves as the administrative center of Kizlyarsky District, even though it is not a part of it. As an administrative division, it is, together with one urban-type settlement (Komsomolsky) and one rural locality (the railway crossing loop of No. 17), incorporated separately as the Town of Kizlyar—an administrative unit with the status equal to that of the districts. As a municipal division, the Town of Kizlyar is incorporated as Kizlyar Urban Okrug. In the early 19th century, Kizlyar became a center of viticulture and wine making. The local cognac factory (Kizlyar Brandy Factory) produces a variety of alcoholic beverages but specializes primarily in a regional variant of brandy, marketed throughout Russia as "cognac". Kizlyarka is a type of grape vodka produced in Kizlyar. Kizlyar is also known for traditional knife, dagger, and saber making. Kizlyar has a cold semi-arid climate (Köppen climate classification: BSk). ^ Jane Burbank and David L. Ransel, Imperial Russia: New Histories of the Empire (Indiana University Press, 1998), 160. ^ TASS. "TASS: World - Four killed, four wounded by unidentified shooter in Dagestan's Kizlyar". Retrieved 18th February 2018. ^ BBC News. "Dagestan church shooting leaves five dead in Kizlyar". Retrieved 18th February 2018. ^ "Climate: Kizlyar". Retrieved 2016-02-27. Народное Собрание Республики Дагестан. Закон №16 от 10 апреля 2002 г. «Об административно-территориальном устройстве Республики Дагестан», в ред. Закона №106 от 30 декабря 2013 г. «О внесении изменений в некоторые законодательные акты Республики Дагестан». Вступил в силу со дня официального опубликования. Опубликован: "Дагестанская правда", №81, 12 апреля 2002 г. (People's Assembly of the Republic of Dagestan. Law #16 of April 10, 2002 On the Administrative-Territorial Structure of the Republic of Dagestan, as amended by the Law #106 of December 30, 2013 On Amending Various Legislative Acts of the Republic of Dagestan. Effective as of the day of the official publication.). Народное Собрание Республики Дагестан. Закон №6 от 13 января 2005 г. «О статусе и границах муниципальных образований Республики Дагестан», в ред. Закона №43 от 30 апреля 2015 г. «О статусе городского округа с внутригородским делением "Город Махачкала", статусе и границах внутригородских районов в составе городского округа с внутригородским делением "Город Махачкала" и о внесении изменений в отдельные законодательные акты Республики Дагестан». Вступил в силу со дня официального опубликования. Опубликован: "Дагестанская правда", №8, 15 февраля 2005 г. (People's Assembly of the Republic of Dagestan. Law #6 of January 13, 2005 On the Status and Borders of the Municipal Formations of the Republic of Dagestan, as amended by the Law #43 of April 30, 2015 On the Status of the "City of Makhachkala" Urban Okrug with Intra-Urban Divisions, the Status and the Borders of the Intra-City Districts Comprising the "City of Makhachkala" Urban Okrug with Intra-Urban Divisions, and on Amending Various Legislative Acts of the Republic of Dagestan. Effective as of the day of the official publication.). This page was last edited on 29 December 2018, at 18:53 (UTC).